In the past, the study of ancient Egypt has been focussed mainly upon its well-preserved funerary monuments. The much less easily-accessed evidence for the settlements in which the people lived has in recent decades attracted more attention, and this volume, for the first time, brings together the findings of that research and previous archaeological data, building a picture of the way in which towns developed. The author also throws light upon the way in which society functioned and evolved by studying the layout of individual homes. In her introduction, the author quickly makes the distinction between towns that were founded by the state and those that grew organically, but points out that the development of the centralised state and the growth of urbanism might not be directly dependent upon one another. In Section 1 she first deals first with general considerations relating to urbanism: the difficulties in determining population sizes because many sites lie under modern habitation, others have not been completely excavated and many have been destroyed in part by sebakh digging and farming. Identification of living space within a dwelling is also problematic, since the traces of staircases indicate the presence of upper floors or usable roof space of indeterminate size. She identifies different categories of settlement, each with well-defined features: the national capital, provincial capitals, state foundations with an urban character, state foundations with a nonurban character, fortresses, specialpurpose settlements and production sites, and rural villages. Section 2 gives a historical overview of settlement archaeology in Egypt and discusses the role of Egyptian settlements in interdisciplinary studies on ancient urbanism, which until now concentrated only on Amarna, Deir el-Medina and Kahun. Other sections cover the effects of the Nile on the siting of settlements and the origins of urban society (including some 22 pages devoted to Hierakonpolis), with separate sections on Old Kingdom settlements (mortuary cult towns in the Memphite region, and the substantial remains at Elephantine and Ayn Asil in the Dakhla Oasis), and the layout of houses in the Old Kingdom and in the Middle Kingdom (including the “Mittelhaus” buildings of Palestinian origin found at Tell el-Daba). One section covers urban development during the end of the Old Kingdom and the First Intermediate Period: the loss of central control from Memphis resulted in towns and cities outside the region becoming more prominent, particularly in the south, such as at Elephantine, where a building of major importance identified as the governor’s residence has been found. Section 8 is one of the largest in the book as the author describes the huge expansion of town planning and internal colonisation that took place in the Middle Kingdom when the country was re-unified under central control. The state-planned settlements at Tell el-Daba, Qasr el-Saga (in the Fayum), Lahun, Abydos and the Nubian forts are discussed in detail, together with the developments at Karnak, Elephantine, Edfu and the major urban centre at Tell el-Daba. The work is copiously illustrated with plans, maps and black-and-white photographs, and a comprehensive bibliography is included at the end of each section. 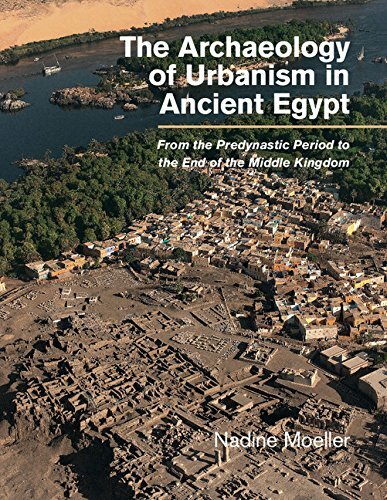 Because of its comprehensive coverage of all known urban sites in Egypt, this will undoubtedly prove to be an invaluable reference work for anyone interested in this growing area of Egyptological study. Many readers will know the name Gayer-Anderson from the iconic statue of a cat which is on display in the British Museum. Some may also have visited the beautiful Beit-al- Kretliya Gayer- Anderson Museum in Cairo. Many may not be as familiar with the man himself. 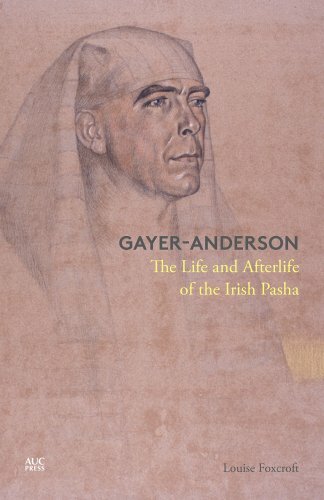 This new biography of Robert Grenville Gayer-Anderson reveals a fascinating picture of a remarkable character. Based on Gayer-Anderson’s own reminiscences, Foxcroft reveals a kind of split personality: on one hand, the respectable conventional military man; on the other, the obsessive collector and aesthete with psychic and cosmic interests. His early life was somewhat unsettled, from his birth in 1887 in Ireland, his early uprooting to America and eventual return to his native land. He and his twin brother Tom were ruled with a firm hand by their rigid father whose strong views on male development forced the boys into themselves, creating rich but secret inner lives. Robert, always known by his twin as ‘Pum’, trained as a doctor before joining the Royal Army Medical Corps at the time of the Boer War. He led a fascinating life in the Sudan and Nubia. His adventures read like a Boy’s Own Comic and were typical of the high days of imperialism: a spell in the camel corps, heatstroke, encounters with cannibal tribes and big-game hunting, carried out between his medical tasks – treating leprosy, sleeping sickness and other scourges. Eventually these excitements began to pall and he returned to his beloved Cairo where he enjoyed the fleshpots while immersing himself in the joys of collecting beautiful objects, which he did obsessively. His belief in his own psychic powers sometimes led him to make wonderful discoveries. One such was a copy of Denon’s Voyage to Egypt commissioned by Napoleon, which turned out to be Napoleon’s own personally annotated volume. After the First World War there was a great deal of anti-British feeling in Egypt. Pum was even targeted as a murder victim by one group who felt because of his status in the city, his death would cause a real stir. He fortunately survived the plot. To overcome these traumatic episodes, he spent some time at Chicago House in Luxor, taking impressions and making casts of the reliefs in some of the tombs of the nobles. These casts can now be seen built into the walls of his Cairo House. When he finally left Cairo for good, he donated his beautiful home to the Egyptian nation. In 1943 he was honoured with the title ‘Pasha’ by King Farouk. At the outbreak of World War II, he concentrated on recording and restoring his beloved objects before donating them to important British museums and some others world-wide. It is for this reason that the world of Egyptology remembers him. The influx of Greek settlers into Egypt following the arrival of Alexander the Great in 332 BC brought with it a diversity of funerary beliefs and practices, reflected in the monumental tombs of the Graeco- Roman period. This long overdue study of the decorative programme of these tombs (illustrated with colour plates and black-and-white photographs) covers a period of more than 500 years (from 300 BC to AD 250), and includes tombs from Alexandria and the countryside area around it (the Chora), from Tuna el-Gebel (including the Tomb of Petosiris and Tomb of Isadora), Siwa Oasis, Arthribis, Dakhla Oasis and Akhmim. Gravestones from Leontopolis that incorporate Greek narratives to express Jewish ideas of the afterlife are also included. The author categorises tombs as Egyptian or Greek based on the narrative and the language used; hieroglyphic texts are found only in tombs with predominantly Egyptian funerary motifs, while tombs based on Greek narratives use Greek text. While many Alexandrian tombs employ Egyptianstyle imagery, real hieroglyphs are never used; these tombs differ from true Egyptian tombs in that the Egyptian content is more of an embellishment, usually restricted to signs and symbols and a signature ‘mummy purification’ scene, whereas true Egyptian tombs reflect the traditional Egyptian narratives required to help the deceased reach the afterlife. Egyptians were more selective in the foreign elements they chose to adopt because of their long-lived funerary tradition but, as the author concludes, this visual interaction was mutually beneficial at a time of political uncertainty for Egyptians and the Alexandrian Greeks’ growing need for ways of visualising life beyond death. This is a fascinating study demonstrating how two culturally distinct peoples were able to recognise similarities in their respective religions, and share imagery in the visualisation of their journey to the afterlife. I thoroughly enjoyed this book – though I am biased: Giza ranks amongst my favourite Egyptian sites. After an introduction to the site of Giza, the author devotes a considerable section of the book to a review of the history of archaeological investigation. 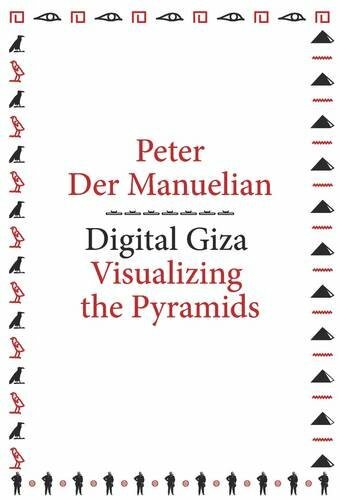 It is clear that Manuelian has ‘lived and breathed’ Giza for many years and his deep insight comes shining through in his account of the key figures that have contributed to our understanding of the site. With the scene set, the book then addresses the matter in hand – ‘Digital Giza’. Over the many years of archaeological investigation, an important site such as this generates a huge amount of material, including handwritten field notebooks, drawings, photographs, published reports and of course, the recovered artefacts themselves. The question posed by Manuelian in 2000 was how best to make this information available to academics, researchers and the layman. Thus was born the Giza Archives Project. During my own research into the Giza necropolis, I’ve used the resources at www.gizapyramids.org frequently and cannot commend the site highly enough. When work began in 2000, it was a truly pioneering endeavour and there are several indications in the book that website updates are in the pipeline. Chapter 4 takes things a step further and explores 3D Giza. At this point, we get to perhaps the most important part of the book – a debate about whether 3D ‘reconstructions’ represent legitimate outlets for academic endeavour. Personally, I have no problem with this approach and see no significant difference in academic rigour between the information presented on sites such as Giza 3D and the infor mation presented in conventional academic papers. The huge advantage of 3D reconstructions is that the interpretation can be presented as a fully interactive image which can be manipulated with a much greater degree of flexibility by the reader. As Manuelian shows in the case studies presented in Chapter 5, used appropriately whilst recognising the limitations of the digital approach, 3D visualisation can be an incredibly useful interpretative tool. The ability to introduce ‘time’ as a variable in the digital realm is particularly powerful, with the potential to provide many fresh insights and to greatly enhance our understanding. Whilst I am generally in favour of the approach advocated by Manuelian, we should not overlook the fact that, just as with conventional academic publications, small but important details can be missed in the 3D representations and this can lead to questions in terms of the interpretation that is presented. In my opinion at least, 3D digital models are probably less prone to this than other more limited methods of interpretation. Overall then, a very rewarding and thought-provoking work but with one criticism: the book is fairly small and with several images included on a single page, their details are difficult to make out. Perhaps I should try to find the relevant images online … maybe that’s the point! 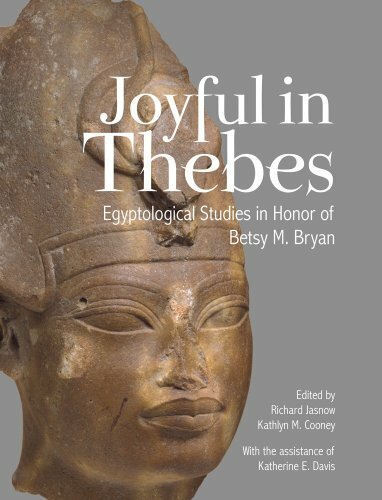 This impressive collection of essays has been assembled as a Festschrift in honour of the American Egyptologist Betsy Bryan. At some 500 pages in length, this weighty volume contains a significant amount of fresh and exciting scholarship. The themes covered reflect Betsy Bryan’s own research interests, a focus of many contributions being on New Kingdom art and iconography. Thus, Bacs, Galán, Laboury and Shirley’s articles discuss aspects of Eighteenth Dynasty tombs and their decoration, Cooney presents evidence for placating the disruptive dead (by the guilty relatives of the deceased) during the Late New Kingdom, Ray Johnson demonstrates a join between two wellknown Amarna reliefs in New York and Copenhagen, and Zahi Hawass presents discussion of the mummies of Tutankhamun and his immediate relatives. Bryan’s name is particularly connected with the study of New Kingdom sculpture and it is pleasing to see articles dedicated to statues of Sekhmet (Berman), lesser-known royal statues of Dynasty Twenty (Burger Robin) and one non-royal statue (Fisher). Eaton-Krauss offers a particularly pithy critique of understandings of adaptation and reuse of monuments – but perhaps the most sensational sculptural claim is that the wellknown Predynastic ‘MacGregor Man’ (a key item in the Ashmolean Museum in Oxford) is a modern forgery. Other notable contributions include Chauvet on the ritual role of craftsmen in Old Kingdom tomb preparation, Bleiberg and Lacovara on impressive items of jewellery, Reeves on the possible pharaonic origin of the iconography of Venus, and Sullivan and Harrower on spatial techniques used increasingly in modern Egyptian archaeology. It would be true to say that there is something for everyone interested in Egyptology here, reflecting the broad interests of the honouree. Many articles offer very detailed analysis of single items/groups or small details, and each is a rewarding read. One small disappointment is that the book is illustrated with black-andwhite photographs and line-drawings only, without any colour images of some of the stupendous objects discussed. 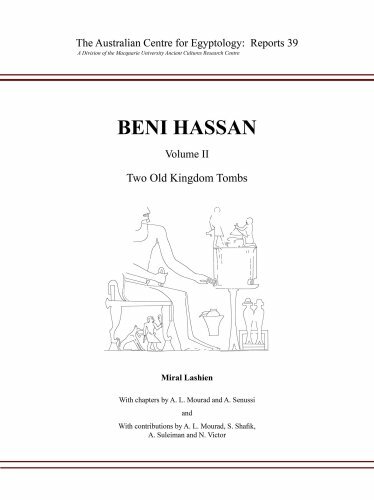 Beni Hasan (or Hassan), the Middle Egypt cemetery site some 20 kilometres south of Minya, is noted for its beautiful Middle Kingdom tombs, the most famous being that of the Twelfth Dynasty nomarch Khnumhotep II featured in Volume I (reviewed in AE91). 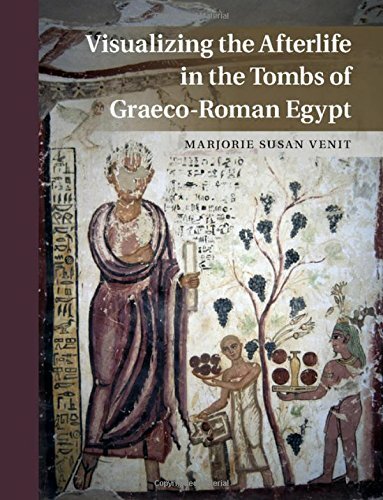 This second volume of epigraphical work by The Australian Centre for Egyptology focusses on two important Old Kingdom tombs, dating to the second part of the Sixth Dynasty (c. 2200 BC). The tombs belong to ‘estate manager’ Ipi (No. 481) and his (probable) son-in-law, ‘inspector of priests’ Bebi (No. 482), who for some reason chose to be buried here, at a distance from their contemporaries in the cemetery to the north. The tombs were explored by Garstang, but have not until now been published in full. The architectural features, inscriptions and scenes are described in detail for each tomb, followed by a table of pottery finds. The scenes are then presented in a series of colour plates and fold-out black-and-white scene diagrams. Although not as well preserved as the later Middle Kingdom tombs, there are some fascinating aspects to these tombs, in particular an unusual scene in the tomb of Ipi which appears to show a fight between boatmen, with one man being rescued unconscious from the water. 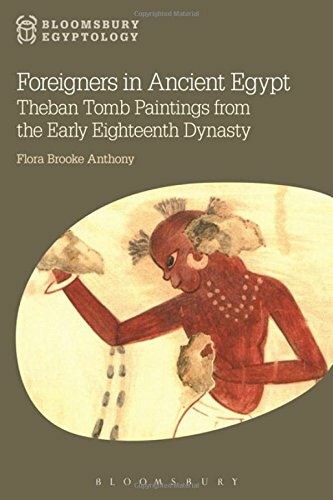 Colourful images of Nubians, Levantines, Aegeans and Libyans immediately come to mind when thinking of ‘foreigners’ in ancient Egypt, particularly those depicted in New Kingdom Theban elite tombs and royal palaces. The early Eighteenth Dynasty (1550-1372BC) was the highpoint of international diplomacy, trade and imperial expansion, and as a result images of foreigners became more common in nonroyal elite tombs. In this volume, Anthony focuses attention on this key dataset and evaluates the complex symbolism of images of foreigners in early New Kingdom contexts. These images were so much more than decorative motifs: they were ideological features specifically placed within the symbolic decorative programme of the tomb. Anthony presents a welcome holistic approach to the iconography of these scenes, placing them firmly in their historical context with their intended ancient Egyptian viewer in mind. The importance of a contextual reading of these scenes is continually emphasised; it is vital to note their physical location, why the tomb was created (and for whom) and relevant Egyptian concepts to understand how these scenes may relate to reality. The author successfully navigates these themes, first presenting the history of foreign representation in Egypt, before offering a useful overview of how different peoples were depicted within the ancient Egyptian artistic canon. A key motif, illustrated throughout, is the ‘foreign tribute’ scene commonly included in non-royal Theban tombs during this period. Here, foreign peoples bringing tribute to Egypt are depicted in an orderly manner, queuing up to present their precious offerings to the king and/or the tomb owner as intermediary. The author dedicates two chapters to the ‘tribute scene’, assessing the underlying symbolism including the theme of order over chaos and the difference between the representation of captive foreigners and tribute-bearers, challenging previous simplistic readings of these scenes. One of the main roles of the pharaoh throughout Egyptian history was to maintain order (ma’at) over chaos (isfet), literally through the protection of Egypt’s borders, and symbolically through perpetual offerings to the gods. The inclusion of tribute scenes in non-royal tombs conveyed the tomb owner’s wish to gain favour from the king and contribute to the maintenance of ma’at while retaining his high status in the afterlife. This idea of layered symbolism is also applied to an assessment of the tribute goods, according to the different tribute- bearing groups. I found this especially useful as it allows the reader to compare clearly the different types of tribute, which ranged from baboons and bears to decorative vessels and precious metals. Illustrated throughout with black-and- white and colour images, with a comprehensive bibliography, this multi-faceted analysis successfully conveys the importance of evaluating ancient Egyptian decorative motifs from several angles rather than taking them at face value. 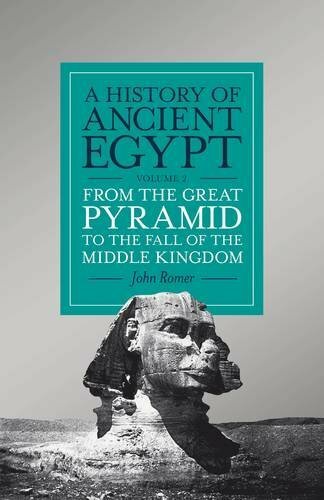 In his first volume published in 2012 (reviewed in AE73), John Romer promised us two books covering the entire history of ancient Egypt. He has since changed his mind. Due to a “cascade of fresh information” leading to substantial revisions to previous ideas about the Old and Middle Kingdom, I’m pleased to say Romer now wishes to dedicate an entire book to this period, with a third volume planned to cover the New Kingdom up to the fall of Pharaonic Egypt. So here, the author takes us from the Sphinx at Giza, through the First Intermediate Period (“History without Pyramids”), to the “Remaking of the State” and subsequent fall of the Middle Kingdom. While the work is packed full of information to please anyone wanting to know more about this fascinating period of Egyptian history, this is not a standard text book for picking up ‘facts and stats’; rather it is a book to sit up all night reading cover to cover! The reader must wait until page 63 for the beginning of Romer’s narrative, as he first waxes lyrical on “how and why [his] vision differs” from the “standard modern version of ‘ancient Egypt’ ” (coloured by the social mores of each successive generation of Egyptologists), discusses the “Making” of ancient Egypt in modern times (beginning with Champollion’s work on hieroglyphs) and highlights the dangers of extrapolating history from surviving fragments of text, none of which are written histories. He argues persuasively that while two centuries of academic research and “scientific breakthroughs” may appear to bring us ever closer to these ancient peoples, the reality is that we are no nearer to a true understanding of their lives – but it is exactly this mystery that keeps us yearning to know more.